I had these cards printed about 10 years ago, after returning from a professional development conference in Colorado Springs. I realised on that trip that being good at my job wasn’t going to be enough of a legacy for me to leave on my gravestone. 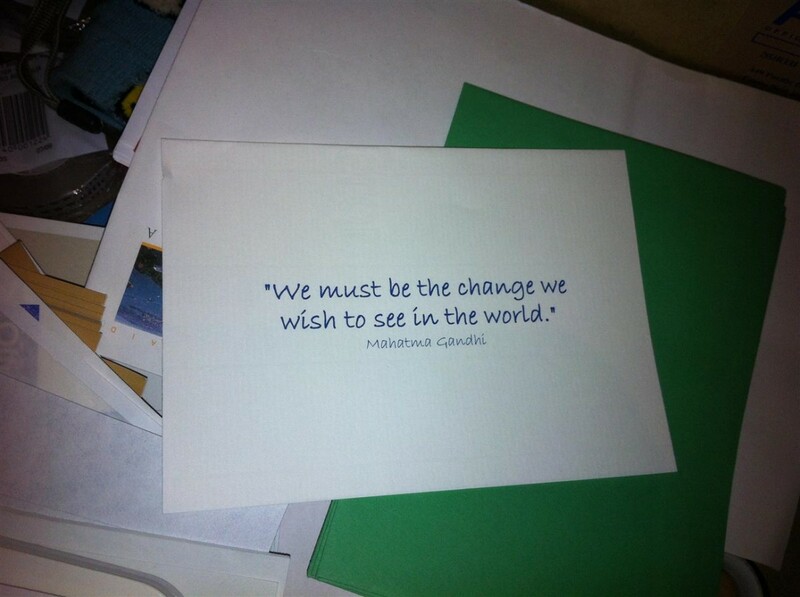 What I really wanted was to change the world… I just didn’t know then what that would might mean! But it really didn’t matter, like most things in my life I simply got started, assuming the answer would appear eventually. It took a few years, but I realized soon enough what that goal meant for me: to see women equally represented in leadership roles, in our workplaces and communities. Why? Because women have the power to change the world; and the world, I reckon, needs women to change things. Tonight as the guest speaker at a FIFI networking event in Sydney, I shared the same thought: that women have the power to change the world (thank you Victoria and team for the invitation). My remit was to share my own career story, peppered with advice and the real experiences of the women I coach to career success. It’s critical, I said, that women take charge of their careers because when women have careers they’re in charge of their futures. A job is good in so much as it gives you an income. But a career, to me, means so much more, including that sense of identity, of expression of your values and motivations, and the pathway to self actualization and financial independence that really creates the true luxury in life: choice. Choice – to be educated, to make informed decisions, to offer a safe and happy environment for our future generations – that changes the world. I try and surround myself with people who not only thrive in their environment, but who make it their goal to make their environment a better place. When I met Nat Isaacs from 1millionwomen about four years ago now, I knew immediately she would change the world too. I became an ambassador of 1millionwomen back then because I believed in Nat’s goal: to get one women million to change the world too by creating a more sustainable future for themselves, their families and the future generations. Since that time 1millionwomen has grown from 700 to 7,000 to 70,000 women all united with a common goal to change the world for the better. Each woman signs a pledge when she joins 1millionwomen to cut one tonne of carbon dioxide from her life, and the website then shows how this can be done: simply, by making minor modifications to the way each woman lives. It can be as simple as recycling and reusing materials at home; walking or taking public transport instead of driving; or by adopting energy efficient practices your home or workplace. Everything counts. 70,000 is a formidable force, but what Nat really wants is for one million women to get on with climate action, cut pollution from their daily lives, live more sustainably and be a powerful voice for change. If that sounds like an outcome you’d like to support too, I encourage you to get behind 1millionwomen and register to host a Recipe for Change event on the weekend of 17-18 November and bring one or more friends together, with the purpose of identifying some of the things – small or large – that we each could do to create a sustainable future. I’ll be hosting a Recipe For Change Event on Sunday 18th November at my farm in the Southern Highlands of NSW and I promised Nat I’d ask you all to get involved too. So if you live in Sydney and feel like escaping the big smoke for the day, to meet some new people and you’re your say on what sustainability means for you, then please come join me and be part of the change too. The farm is beautiful this time of year, and just a 90 minute drive from Sydney Airport (click here to RSVP and receive detailed directions). BYO picnic basket, ideas to reduce our footprint on the earth, and an empty egg carton that you can refill fresh from the henhouse! If you live further afield, you can register to host your own get together – a coffee catchup, brunch, lunch or just a walk in the park together. So… can one million woman change the world? You betcha. The real question is, what role will you play? ← WEConnect: a life changing opportunity for Melbourne’s entrepreneurs?